Auxins are a class of plant hormones (or plant growth substances) with some morphogen-like characteristics. Auxins have a main role in coordination of many growth and behavioral processes in the plant's life cycle. they are essential for plant body development. Auxins and their role in plant growth were first described by the Dutch scientist Frits Warmolt Went. 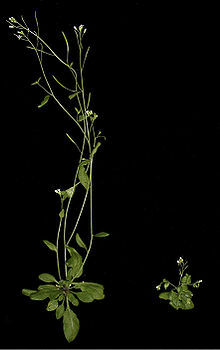 Kenneth V. Thimann isolated auxin and found its chemical structure to be indole-3-acetic acid (IAA). Went and Thimann co-authored a book on plant hormones, Phytohormones, in 1937. There are synthetic auxins, and in big doses they can be used as herbicides. Agent Orange is a mixture of synthetic auxins. ↑ Taiz, L.; Zeiger, E. (1998). Plant Physiology (2nd ed.). Massachusetts: Sinauer Associates. This page was last changed on 18 June 2016, at 04:27.